FORTALEZA BEACHES offers the best Fortaleza day trips to Ceara's most popular beach destinations, departing from all hotels in Fortaleza and Beach Park, 7 days a week. Working together with Fortaleza's best tour operators gives our guests the opportunity to see more of our coastline during their visit to Ceara Brazil. Why you should book your Fortaleza Day Trips with us ! Take a Fortaleza day trip right from your hotel's front door with no pre-payment required and need to pay the hotel's rate when you can pay the local discounted rate. Simply reserve your seats from the form below or call us the day before your trip. Pay the guide in local currency when boarding the tour van or bus. best suite your needs ! With over 640 kms of South America's most spectacular coastline within reach from Fortaleza. The most popular Fortaleza day trips are listed below with all the information necessary to help choose the trip that best suite your needs. Our most popular Fortaleza Day Trips list ! Beach Park Day Trip: 16 kms from Fortaleza. The largest Water Park in all of South America is only 30 minutes away from most hotels in Fortaleza and hosts a 40 meter high water slide and endless number of other attractions to make this one of the most memorable days of your holiday. Beach Park & Resort has a variety of good restaurants both in the park and along the beach. Schedule: Beach Park Day Trip departures daily 9:00 A.M. Return 18:00 P.M. Except for the days when the park is closed for maintenance. 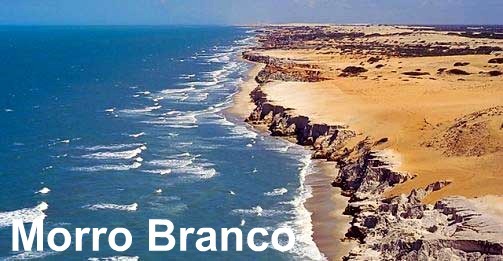 Morro Branco Day Trip: 84 kms from Fortaleza. Internationally known for its multicolored dunes and cliffs that run the entire length of Morro Branco's beach. Only 5 km from Beberibe. The surrounding area is within the protected zone of Parque Nacional das Falesias. To this day the village is populated by a small group of fisherman. The main attractions are the buggy rides over the dunes and along the beach, exploring the caves, and bathing in the natural springs. 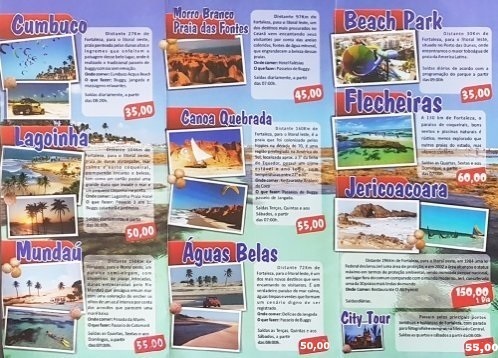 Schedule: Morro Branco Day Trip departures daily 8:00 A.M. Return 18:00 P.M.
Praia das Fontes Day Trip: Praia das Fontes Day Trip: (90 kms from Fortaleza) Praia das Fontes is one of Ceara's natural wonders. Only 5 kms from the infamous fishing village Morro Branco and within easy reach of Lagoa do Uruau, Ceara's largest lake! Schedule: Praia das Fontes Day Trip departures daily 8:00 A.M. Return 18:00 P.M.
Canoa Quebrada Day Trip: 160 kms from Fortaleza. The most visited beach destination from Fortaleza for a variety of good reason. Surrounded by some of Ceara Brazil's most spectacular scenery. Lies hidden between the towering dunes and red sand stone cliffs that protect it from the sea. A perfect place to enjoy the sun and sea breeze, while relaxing in one of the barraca (beach bar-restaurants). Schedule: Canoa Quebrada Day Trip departures daily 8:00 A.M. Return 19:00 P.M.
Cumbuco Day Trip: 38 kms from Fortaleza. Once inhabited by a small colony of fisherman was one of the states first beaches to be explored by tourists. Completely surrounded by huge Sahara like sand dunes and bordering on a long extending beach lined with coconut trees. The main attraction is the buggy rides and horseback riding over the dunes with a stop on the shores of Lagoa do Parnamirim. Schedule: Cumbuco Day Trip daily departures 8:30 A.M. Return 18:00 P.M.
Lagoinha Day Trip: 110 kms from Fortaleza A perfect extension of beach, long considered one of the jewels of Ceara’s coastline. The yellowish red dunes come together with the crystal clear turquoise sea to make for one of the regions most familiar postcards. An astonishingly beautiful and harmonious setting to visit and explore. . Schedule: Lagoinha Day Trip daily departures 8:00 A.M. (except Sundays) Return 18:00 P.M.
Jericoacoara Round Trip: (Go and return sameday) 320 kms from Fortaleza. Considered of of the most beautiful beaches in the world, with its amazing Sunset Dune and panoramic views in every direction. Surrounded by a National Park that makes Jericoacoara worth the effort to visit during your stay in Ceara. 2 Jericoacoara transport options here! 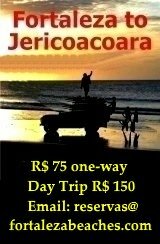 JERICOACOARA DAY TRIP (go and return sameday): INCLUDED: Roundtrip transport by small air conditioned bus; Fortaleza/Jericoacoara/Fortaleza. The transport by open back pickup "jardineira" to Lagoa Paraiso, Arvore da Preguiça, Praia do Prea, and a walk with local guide to Pedra Furada, Jericoacoara village and the Sunset Dune. 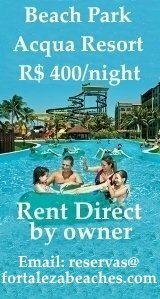 (the hotel must be situated between Praia de Iracema and Praia do Futuro). Return Jericoacoara is scheduled for 18:30 P.M. shortly after Sunset. 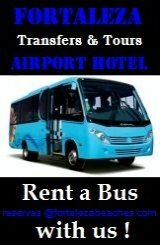 Your group arrives in Fortaleza between 09:00 - 10:00 P.M.
JERICOACOARA ROUNDTRIP (return on a different day): Includes roundtrip transport by small air conditioned bus; Fortaleza/Jericoacoara/Fortaleza. The return trip includes a 2 hour stop in beautiful Lagoa Paraisio/Jericoacoara where you can take enjoy the scenery,swim and eat lunch before the trip back to Fortaleza. between 7:00 A.M. - 8:00 A.M. Return Jericoacoara hotels 09:00 A.M.
Our Fortaleza Day Trips can be booked the day before departure. No money transfers or credit card details are necessary to reserve your seats. Your reservation will be confirmed within 24 hours when you fill out the form below.You will be provided with our local phone number and contact information. We recommend reserving in advance during holidays or high seasons. 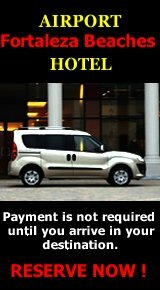 Inquire about booking a round trip (return on a different day) to reduce the costs of expensive transfers from your hotel in Fortaleza to Cumbuco, Jericoacoara, Canoa Quebrada, and other beach destinations. e-mail this form below directly to FORTALEZABEACHES.COM. We look forward to having you on board !